In 2003, Angélique Schmeinck – one of the only two Dutch female master chefs – has a dream. 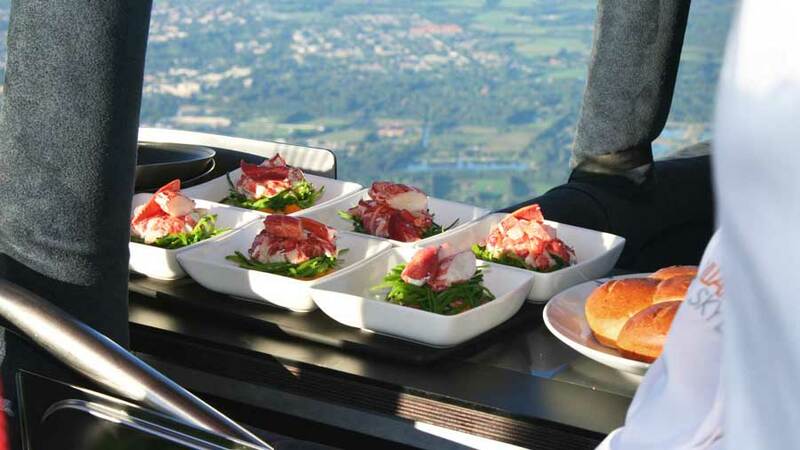 Preparing exquisite dishes in a hot air balloon ride, using the balloon as a huge convection oven. Her idea turned out not to be full of hot air. With the support of Adrie Spierenburg and his wealth of expertise, CuliAir took to the skies. It started off as a wild idea, which soon crystallised into a solid plan. Never just let them get away, these crazy ideas, because just like this one, they may just prove to work! So is the heat inside the balloon sufficient for cooking? It certainly is! With a volume of 10.000 cubic metres and a height of 50 metres, a balloon can function as an enormous convection oven. Internal balloon temperatures may rise to around 100 degrees Celsius, which in kitchen terms means that food can be cooked slowly at ‘low’ temperatures. This is the perfect technique for aroma development and for preserving the juices in fish or meat dishes. The idea is as simple as it is spectacular. Using an ingenious pulley construction, the dishes are transported to the crown of the balloon envelope in special-purpose steel oven baskets. After cooking, dishes are hoisted down to the specially arranged kitchen, where they receive a live cooking finish to perfection with crisp vegetables and a delicious sauce. Temperature sensors line the interior of the balloon, which can be inspected from the kitchen basket during flight. This allows the chef to determine exactly whether dishes should be slightly lowered or raised over the heat source in order to achieve a perfect result. The finished dishes are presented in style, and guests are able to enjoy both taste and view from set outboard tables. Presently, the sky bound spectacle, the original preparing method, and the total experience of culinary ballooning have made their way to a growing audience hungry for more. Taking to the skies gently as a breeze, dining with top wines between heaven and earth, floating out into the infinite… Is this enjoyment at its height? Definitely!